The 1080° series is credited as one of the pioneers of the Extreme Sports genre, which includes games where you race and pull off stunts to rack up a high score (which is a bit unfair on the earlier Wave Race 64). The snowboarding stunts are all real ones, and require you to push a set series of buttons to pull off. 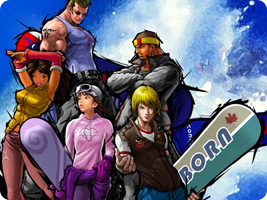 The series is notable for attracting high-profile snowboarding sponsors and real bands to compose the punk-rock soundtrack - neither of which are particularly common traits of Nintendo's in-house games. NinDB is not affiliated with Nintendo or related companies.